CONTENT CONSUMERS, INCLUDING GAMERS, ARE BECOMING THE CONTENTS PRODUCERS THEMSELVES. AND THEY WANT THEIR DISPLAY TO EVOLVE. TRUE 21:9 CURVED ULTRAWIDE SCREEN REAL ESTATE. 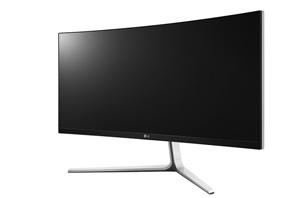 29UC97C has a curved screen real estate with 2560x1080 UltraWide screen. This means one 29UC97C covers 1.8 larger display real estate than a 16:9 ratio Full HD panel. Sound editors can have extensively wider sequence and more track decks in their Protools to get a bigger picture of their music, while video editors can save time since they do have to job back and forth between sequences in PremierPro. In general, this space will let you seamlessly use multiple graphic tools, thumbnail images, and web pages all at the same time. With the IPS screen supporting the 178' viewing angle with the curved panel lets you absorb everything without blind spots with the most important, 'comfort'. 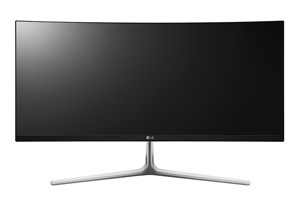 The curve on 29UC97C IPS panel such superior viewing angle, wrapping the entire 29-inch screen around your range of vision. Topped with its aesthetic design, extraordinary changes in your workstation and entertainment suite await you. 29UC97C'S TRUE-TO-LIFE COLOUR PALETTE SCOOPS RICH, VIRANCE OF REAL WORLD AND SPLASHES IT IN FRONT OF YOU. VISUAL COMFORT PLUS PIN-POINT COLOR EXPRESSION WITH sRGB OVER 99% OF COLOR SPACE As your eyes are reaching both edges of monitor, what you discover sensing is surprising visual comfort that lets you capture every single details on the screen. Covering over 99% of sRGB color space, the 29UC97C will deliver true-to-life color experience to you. BREATHE IN, BREATHE OUT. WE WON'T LET YOU GET LOST IN OUR 21:9 ULTRAWIDE SCREEN SPACE. With all the immersive screen space you have now with UC97C, your attention span feels somewhat challenged. 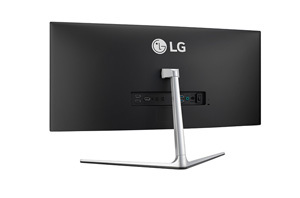 Ready couple clicks away, LG prepared pre-proportioned screen split function that windows do not interfere and create clumsy layers of tasks at hand. Without ever-hindering screen overlaps, cluttering your multi-tool tasking, imagine yourself seamlessly searching for images on the web, doing Photoshop touch-ups of the image, then dragging the product unto PowerPoint, with all the windows spaciously open. TWO DIFFERENT DEVICES CAN NO LONGER FORCE YOU TO USE TWO SEPARATE MONITORS. SUBDUE THEM UNDER DUAL LINK UP & DUAL CONTROLLER. If you are in a situation where you have to work with, say, PC and Mac simultaneously, your attention strain let alone physical fatigue from maneuvering your chair left to right are a real bummer. But not to despair. UC97C has another efficiency function, Dual Link-up feature. Two Individual devices connected to the monitor in a 1:1 spatial ratio, allowing the monitor to divide up the screen for both outputs. 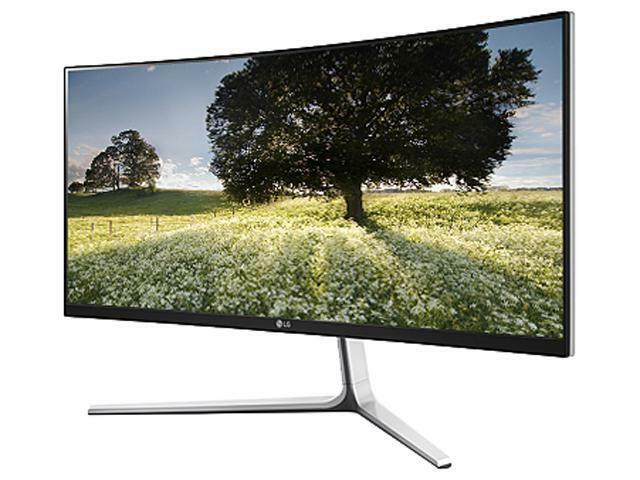 So, if you have to, you can certainly fit two different worlds into our 21:9 Curved UltraWide UC97C. Not only that, while those two devices are show in a single UC97C, you can even fuse the contents from one device to the other one. Dual Controller software will allow your documents from transferring without the help of data transferring device. * Dual Controller operates when the two devices(ex. PC and Mac Pro®) connected to UC97C share the same network. * You can download the Dual Controller Software from Product Support page. THE ULTIMATE IMMERSION PERFECTED THROUGH CHARGING SOUND AND "INSANE" FIELD OF VIEW IS JUST SO… ADDICTIVE. What makes up a wholesome experience of enjoying games and movies? Fidelity of view and sound that is so powerfully convincing to the point where you notice only the reality in the display, wouldn't it? And you will find just that in UC97. Combined with LG's signature Curved UltraWide field of view and the rich, full sound with deeper bass and crystal clear highs with MAXXAUDIO® technology, UC97 delivers the level of immersion what others only can try to imagine. Equipped with two 7w internal speakers and MAXXAUDIO® technology, the UC97 provides cinema surround-sound-like audio effect. So with MAXXAUDIO®, 21:9 UltraWide IPS field of view, you have got the future gaming experience far above far. What fun is gaming, if you can't get into it? ACTUALLY, TOP GAMES HAVE MOVED ON TO THE 21:9 FIELD OF VIEW. Growing number of game enthusiasts are tuning into what 21:9 offers for their virtual adrenaline rush. Most of them recognize that 21:9 is just better, realistic, immersive space for their field of view. 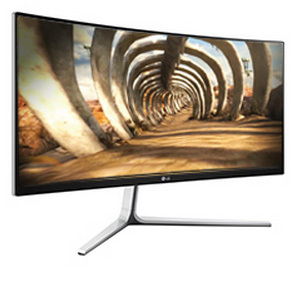 But back in a while concerns were more about the game industry; would there be enough games to play on 21:9? Well, game makers definitely have stepped up and turning more of their latest with 21:9 view ratio. Just take a look at the names of the games on the list. These are not just any games, but top-notch international best & steady sellers. WITH OUR TESTED FLICKER SAFE, YOU CAN HAVE SO MUCH FUN, WAY TOO LONG. We noticed that some of the gamers who play on LG's 21:9 UltraWide monitors often find themselves spending much more time than before as these monitors breathed life into their virtual race and battles. 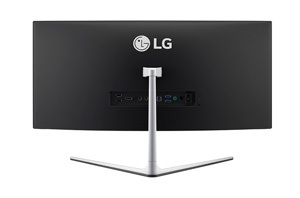 As we recognized FlickerFree feature is crucial for protecting your eyes from long hours of monitor gazing, we made sure LG 21:9 UltraWide monitor is rigorously tested to keep its Flicker elimination function in check and a hot click away. (LG's "Flicker Safe" is always on to reduce the flicker level to almost zero.) So, feel the relief- your eyes are safe from working, gaming, or watching movies. Pros: i bought this because everything was too small on my 4k 28'' Acer monitor and working was not comfortable , especially with adobe premiere. 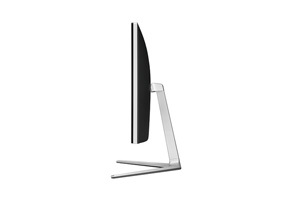 Now this curved ultra widescreen monitor is perfect for productivity. -watching videos that are fullscreen introduce black bar on each side. But movies with black bar are fullscreen . Pros: Crystal clear picture, easy setup, sturdy stand. Once I got the monitor setup properly, (for about 3 days, I could only get picture on one half of the screen, until I hit the reset option in the menu, then Voila! ) The picture is impressive, resolution is excellent 2560x1080 and the gaming experience is immersive. Cons: Despite saying in the description, this Does Not come with a wall mount bracket. 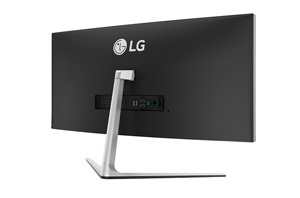 It also is not VESA compatible, requiring a special mounting bracket from LG. Here's the problem, despite being able to find the product on the LG website, the product number doesn't show up in any form fills, which are required to send an email, therefore, it is impossible to send an email about this problem. Live chat is never available. Phone calls go to Bangladesh. I called customer service, and despite claiming on the website that the bracket is included in the box and can be provided by phoning customer service, customer service claims that it isn't in the box and has to be purchased. Fine, so I called purchasing and they told me that they don't have this particular monitor, or the bracket. Now I have to build a special shelf to stand the monitor on. 9 out of 9 people found this review helpful. Did you?